Perfect for flush along side sanding. - Labyrinth construction protects unit from sanding dust. - The front precision roller runs on sentried brushes to give accurate belt alignment. 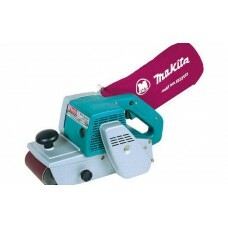 - The front auxiliary handle is specifically locate for fatigue free and sustained sanding. - The externally accessible brushes can be quickly exchanged when they become worn out. Labyrinth construction protects unit from sanding dust. The dust bag collects dust from a very efficient dust collector fan. 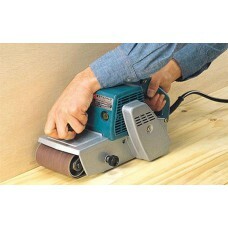 The bag fits inside the perimeter of the sander itself thereby enabling sanding flush into the corner. A zipper in the bag allows dust to be disposed of quickly. The spade handle, incorporating the trigger switch, is ergonomically designed for comfortable control of the sander. The cable sleeve protects the supply cord and keeps the cable out of the way. The belt cover is easily removed should the belt drive require replacing. The belt tracking knob adjust the position of the front roller in relation to the back roller to centralize the sanding belt. The front precision roller runs on sentried brushes to give accurate belt alignment. The front auxiliary handle is specifically locate for fatigue free and sustained sanding. The externally accessible brushes can be quickly exchanged when they become worn out.